IF you can see the above on your Google+ profile, then Google+ search has been enabled for you. If you still see the old "Find people " text, you have to wait for some more time, as Google rolls out the search to you. With search Google made an entry into the web. 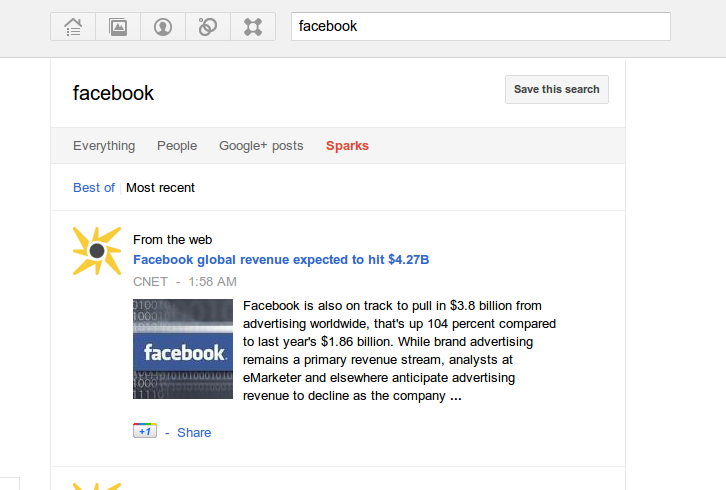 Now with search in Google+, google has made real entry into social networking. Google announced a slew of changes that makes Google+ such a better platform. Google+ going public, Hangouts API and Google+ search. But if you measure these improvements by impact they can have, Google+ search definitely stands out. With search coming to Google+ now, I have more reasons to spend time on Google+. 1.) When people don't know what to do, they generally visit networking sites ;). And now when they don't know what to do in Google+ they have a search box. 2.) For the first timers Search Google+ is a much better option when compared to the feature lists. Its hard to find the strangers whom you can circle. But now you can search for your interests and then circle the people who have written or shared those interesting articles. 3.) It is easy to find your own old Google+ posts. This was really frustrating as it was difficult for me to find my own posts, when I wanted to link them or read myself. 4.) It is easy for others to find your posts. With search coming now, the floating traffic for your posts will increase for sure. And you might be surprised to find out that your old posts which were inactive for long(that has to be less than three months as of now), getting revitalised again. 6.) Most recent : This will help you find the latest content regarding your search term. But if Google+ has to make use of the full potential of this.If Google+ can spice up this feature with the real time updates, it has all the potential to make twitter obsolete. 7.) Save this search : Find the content you want easily, every time you want it. That is what this save this search will do. It will be added as a spark left column. 8.) With search coming up there is more reward for becoming more public. So public will be the default option for many from now on. 9.) Mind my words, search web is not gonna come to Google+, until Google+ starts supporting Ads. Remember that Google makes most of its bucks from Ads. Social Bucket © 2015. All Rights Reserved.